Where: Gilliam Indoor Track Stadium | College Station, Texas | Dec. 10 | 3 p.m. 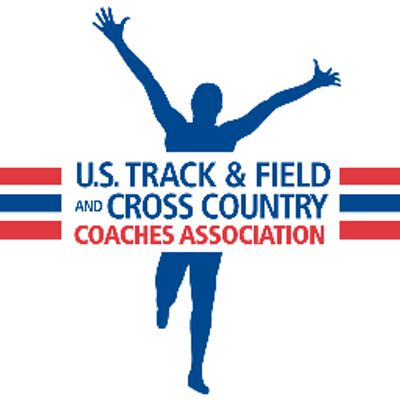 The Cougars are expected to have 15 freshmen make their NCAA debuts at the Reveille Invitational, including IAAF World U20 Championship qualifiers Samiyah Samuels, Nathaniel Mechler, Anna Larsson and Klara Mattsson. On the flip side, five seniors are scheduled to compete in the first meet of their final season, including thrower Damon Thompson. The school record holder in the men’s weight throw, Thompson enters the event with a personal-best throw of 62-8 (19.10m). 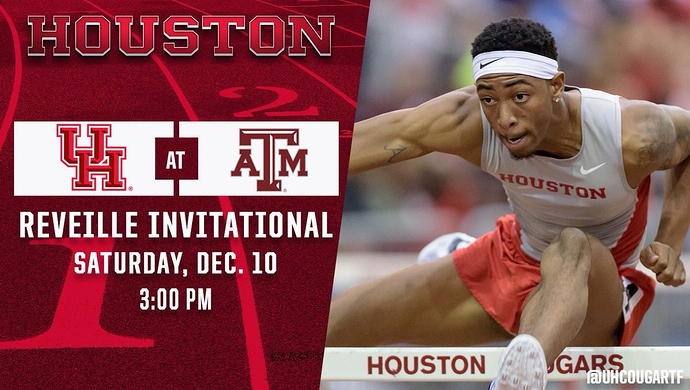 Two-time American Athletic Conference Champion Amere Lattin is scheduled to return to the track in the 60-meter hurdles, while senior distance runner Brian Barraza is slated to make his return to action after redshirting during the cross country season. 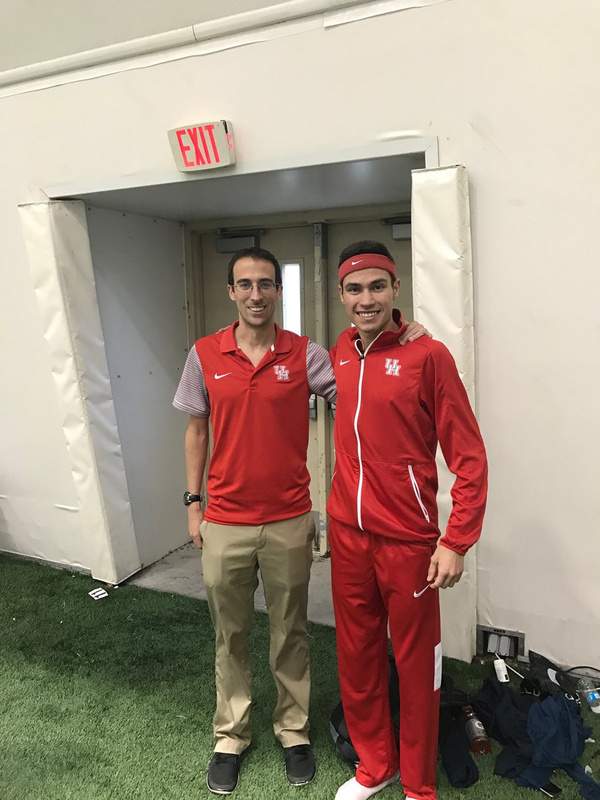 COLLEGE STATION, Texas – The Houston Cougar Men’s and Women’s Track & Field teams started the season in impressive fashion, winning five events, including Brian Barraza’s school-record setting performance in the mile run, at the Texas A&M Reveille Invitational, on Saturday. After redshirting during the cross country season, Barraza made his return to competitive running in the one-mile run to open the indoor slate. Barraza cruised through the eight-lap race in 3:58.66 to set a new school record, breaking the previous best of 3:59.64 set by Olympian Leonard Hilton in 1971, and win the event by 17 seconds. Barraza’s time lands him No. 1 on the collegiate list for the mile early in the season, and he now owns five program records for the Cougars. The El Paso, Texas, native also owns indoor records in the 3,000-meters (7:59.66, 2016) and 5,000-meters (14:23.29, 2014) as well as outdoor records in the 5,000-meters (13:52.52, 2016) and 10,000-meters (29:04.11, 2016). Freshman Samiyah Samuels burst onto the scene in a big way on Saturday, winning the long jump in College Station with a best of 19-5.5 (5.93m). Samuels, a 2016 IAAF World U20 Championship qualifier, holds the 11th best mark in the United States through the first week of competition with her jump. After missing the 2016 season due to a knee injury, junior thrower Cameron Cornelius was excited to get back in the shot put ring to open the season. Cornelius showed he hasn’t lost a step, throwing 57-7.0 (17.55m) to take home the event. Through the opening weekend of competition, Cornelius holds the No. 13 ranking in the NCAA with his throw. Amere Lattin, the 2-time American Athletic Conference Outdoor Champion as a freshman was on the track to open the 2016-17 season in the Reveille Invitational’s first event. Lattin clocked the nation’s second fastest time at 7.85 to win the 60-meter hurdles and set a new personal best. Houston swept the long jump competition at the Texas A&M Reveille Invitational, when Cameron Burrell joined Samuels on the podium. Burrell leapt 24-7.0 (7.49m) to win the event and rank himself No. 6 on the NCAA list through the season’s first meet. Houston picked up 27 top-5 finishes while opening the season in College Station for the ninth consecutive year. Antwan Dickerson finished as the runner up in the long jump with a mark of 23-2.75 (7.08m), while high jumper Colin George took second at 6-10.25 (2.09m) in his event. George’s mark ties for the 21st best performance in the NCAA this season. In the women’s field events, Haley Houston and Taylor Scaife landed some of the top performances of the competition. Houston finished third in the pole vault with a best mark of 12-11.75 (3.96m), while Scaife also took third in the weight throw at 58-1.25 (17.71m). Houston’s mark is the eighth best in the NCAA throughout the young season. In the sprints, Tori Williams opened her senior season with a fourth place finish in the 200-meter dash, crossing the line in 24.15, while freshman Sierra Smith began her collegiate career with a 7.58 in the 60-meter dash to finish fifth. William’s mark is the seventh best time according to TFRRS.org, while Smith ranks 27th. Well...@BRazzleDazzle5k just ran a 3:58 mile indoors in December...Breaks UH Olympians Leonard Hiltons school record!